because it screams "crisp!" and "apron!" and "dolly!" 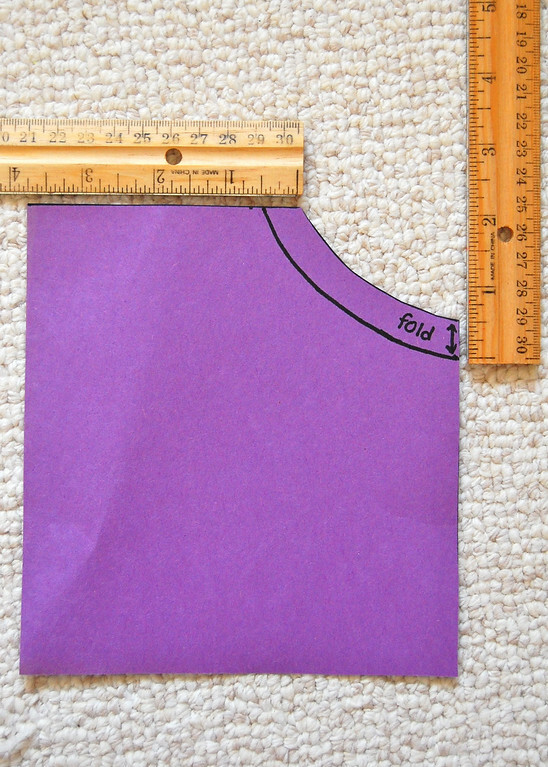 how to draft it from the pleated pinafore bodice pattern. 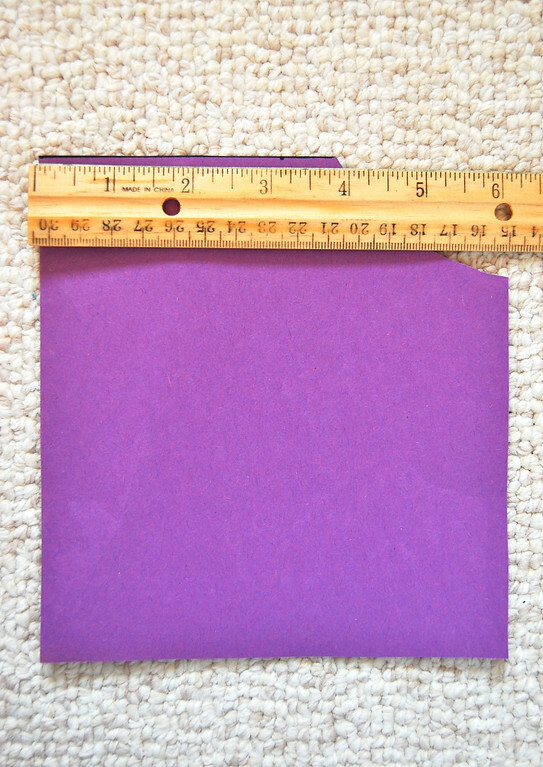 Take the pattern for the main bodice (we don't need the waistband) - mine is brilliant purple for visibility. Draw a horizontal line to partition off the yoke. Make the yoke as high as you like. Mine was about 1.75". 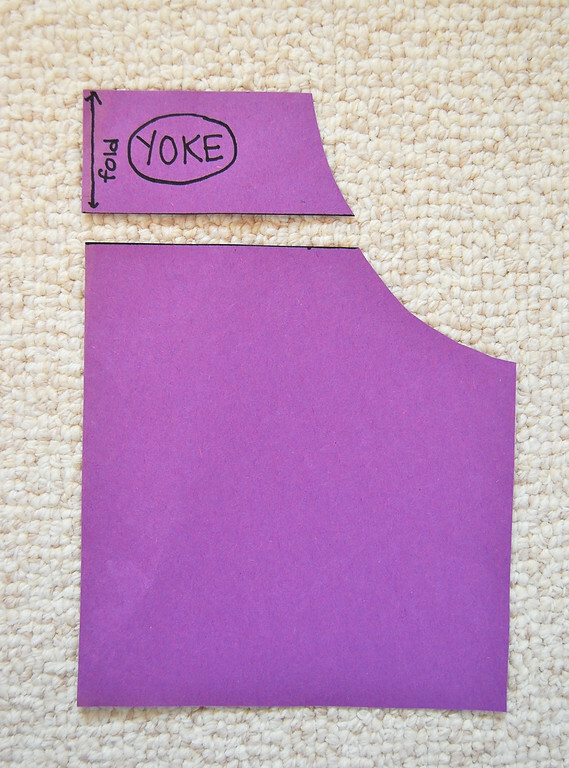 Step 2 Write "yoke" on it, and draw an arrow to remind you which edge to place on the fold of the fabric. 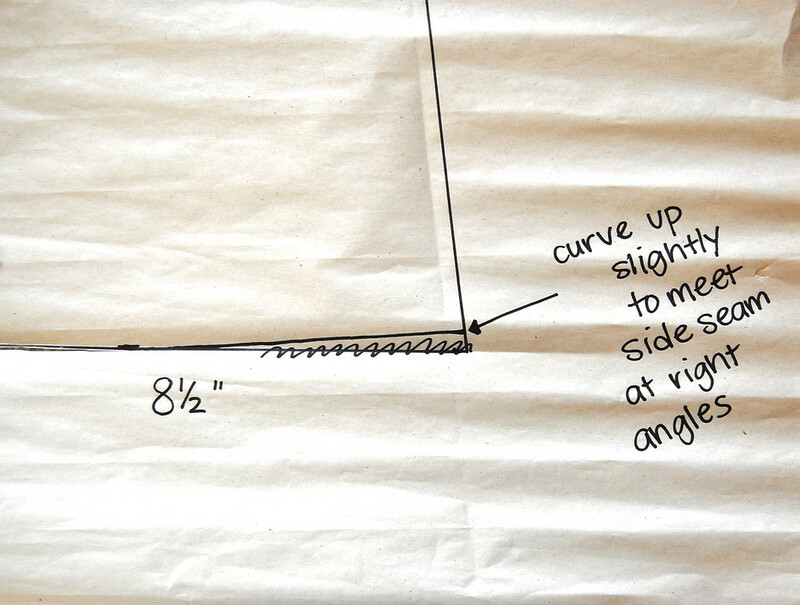 Measure the width of the line where you cut the yoke off. Mine was about 3.75". 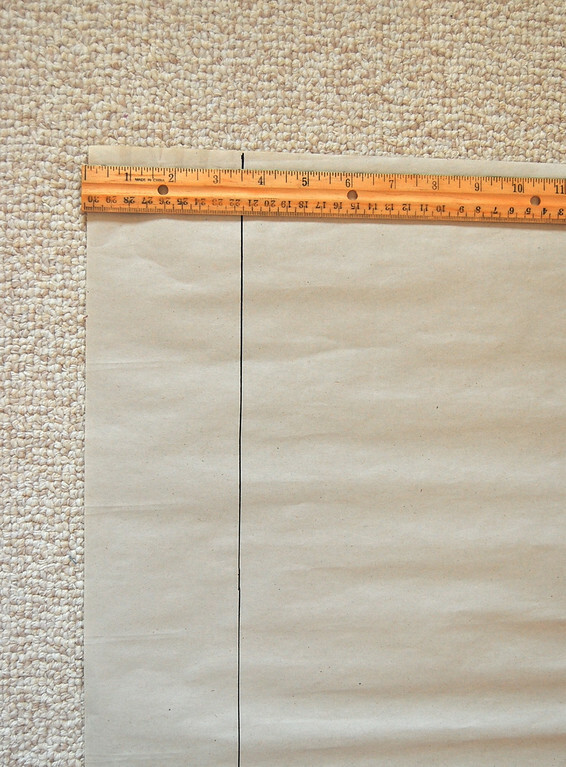 Take butcher paper/newspaper/drafting paper and draw a vertical line roughly the same distance (I rounded mine down to 3.5" - no reason) from one long edge. Q: Why? Why? Why? Why? A: Patience, dear reader. Scroll down and follow along. All will be revealed. This column is just extra width that will become gathers in the middle of the dress. 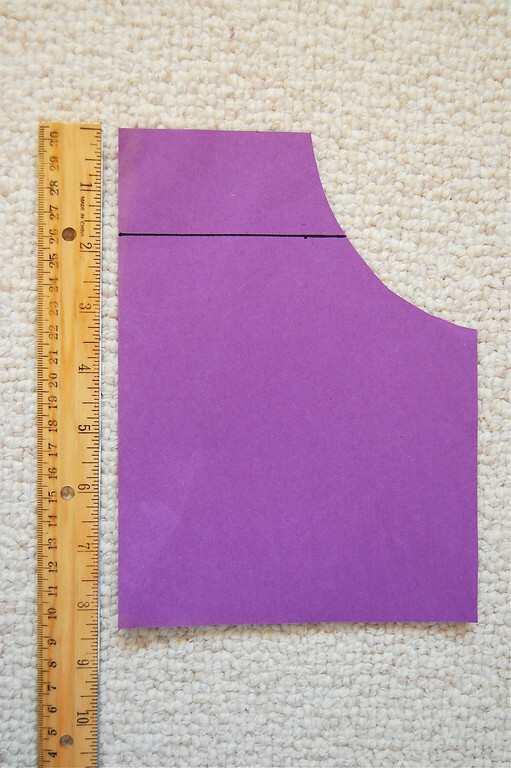 Place the yoke-less bodice pattern on the line like so and trace around it. 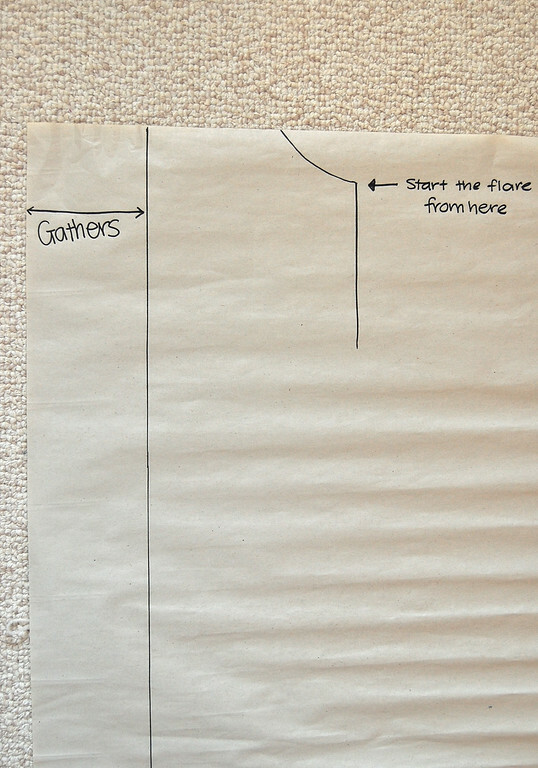 If you like, you can write "gathers" in the column, just to remind yourself what it's there for. Or to stop yourself freaking out. Remove the original purple pattern and lay it aside. Now look at your new pattern - notice that it is the same shape as the old pattern, except that it is wider. Notice also that it is roughly twice as wide (at the yoke line). 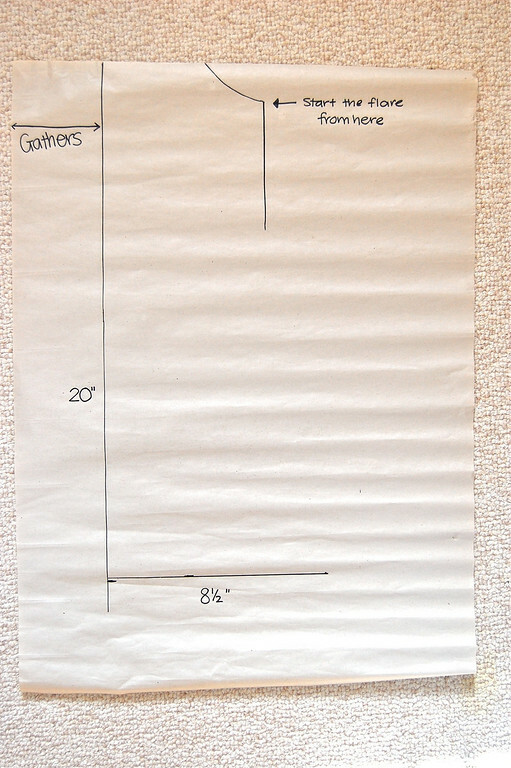 For simplicity throughout this entire blog, each time I introduce gathers in a garment (shirring, ruffles, gathered skirts etc), I use a general rule of thumb: the pre-gathered width is roughly 1.5 to 2 times that of the post-gathered width. This is completely arbitrary. Some people like more gathers (like if you made this a maternity dress!) and some like less. For the front of the dress, I'm going with the "2 x" ratio. You pick what you like. 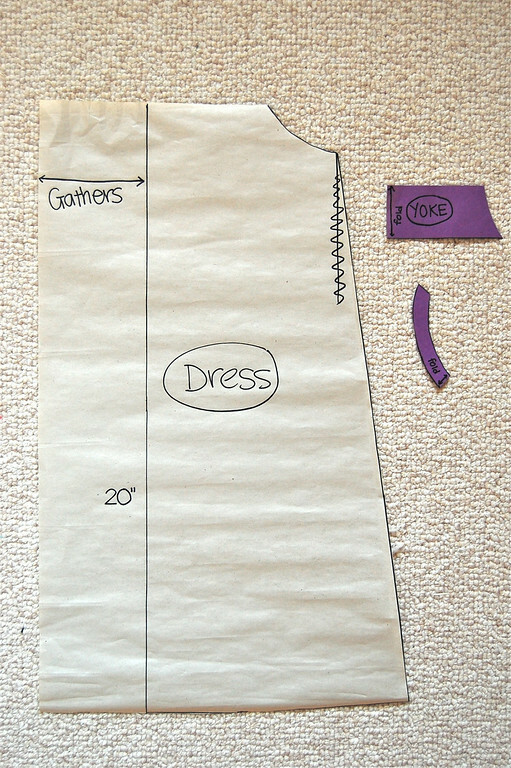 Measure your child and determine how long you want the dress to be. 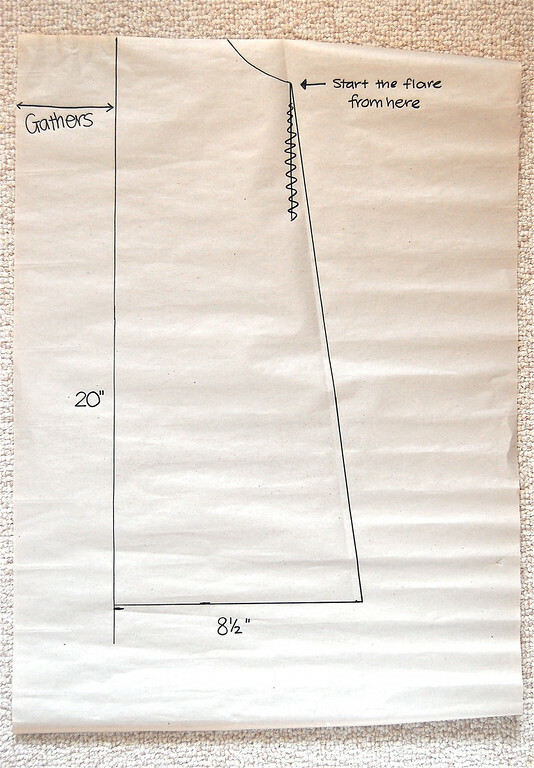 Q: Where do you place the top end of the measuring tape? Do you just randomly plonk it on some point on the child's chest? A: If you like. But I took mine from the height of the armpit. If you look at the pattern, the yokeline is just a little higher than the bottom of the armscye. Given that jumper armscyes are generally loose around the arm, I'd say the armpit is a good point to start measuring from. So measure from the armpit to the knee, or wherever you want the dress to end at. If it ends up a little long, you can always trim the bottom hem in the later stages. 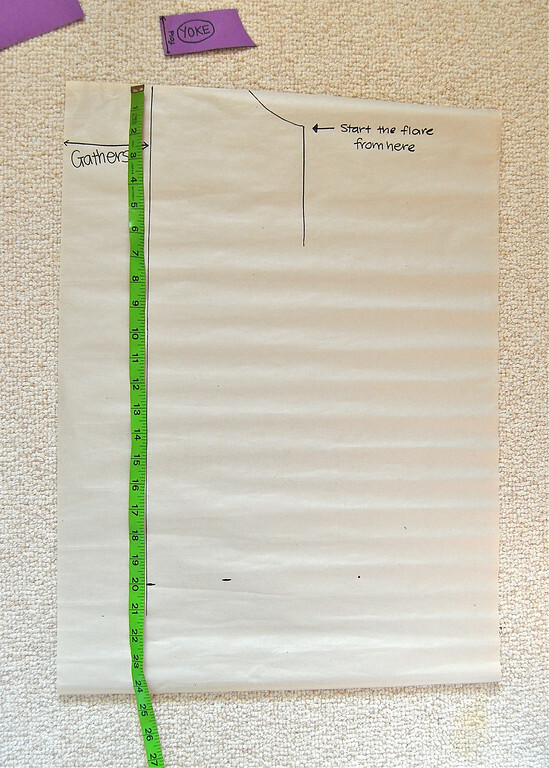 Moving on now - mark off on this distance you measured: mine was 20" from armpit to knee. Draw a horizontal line from that mark - this is your bottom hem. The longer this line is, the wider the flare of the A-line will be. Mine was about 8.5". Q: Back up! Back up! How did you get 8.5"? What is it - some magic number? A: No. It's completely personal preference. I've been drafting a while now, so I sort of know what sort of slant I like in my A-lines. BUT I know that is extremely useless information, so here's a secret: it is perfectly OK to get an old dress from the closet that fits well, and measure how wide the bottom hem is. Or estimate. Or look at a commercial pattern that you have. Bearing in mind that there are gathers in this dress, I picked a less-flared A-line to avoid having Emily swim in a tent later. If there were no gathers, like in the buttoned-shoulder jumper, I'd have liked a wider flare. Draw a line connecting the bottom of the armscye to the open end of the bottom hemline. This is your new side seam. Scratch out the old (vertical) side seam. Curve the bottom hem up gently to meet the side seams at right angles. No, don't use a protractor. Usually it needs to be raised by about 0.5". You can refine this in the final stage when you are actually sewing the bottom hem. Q:Yes, but why right angles? A: So that the hemline continues through the side seam in a smooth line without pointy corners. Law of reflection, if you remember Physics from school. And with that, your main dress pattern is done! 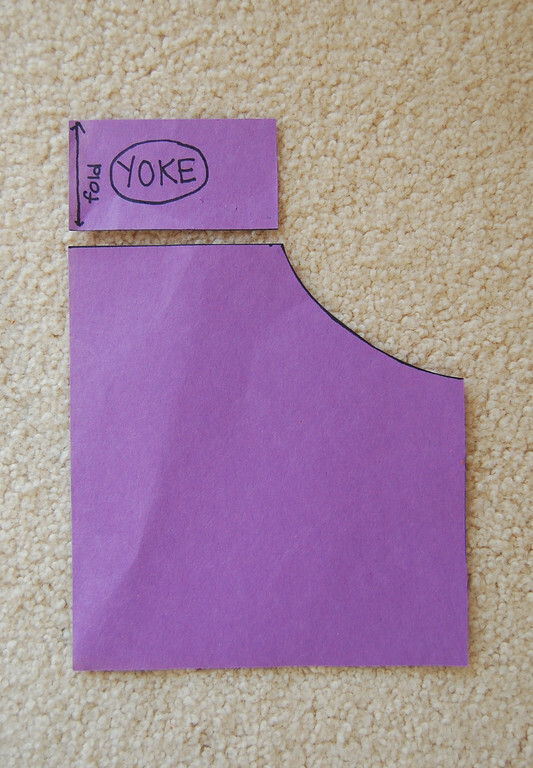 Take the original yoke-less pattern from Step 5. Cut a curved strip off the armscye. It should be of uniform width. I wanted mine narrow, so I used 0.5". 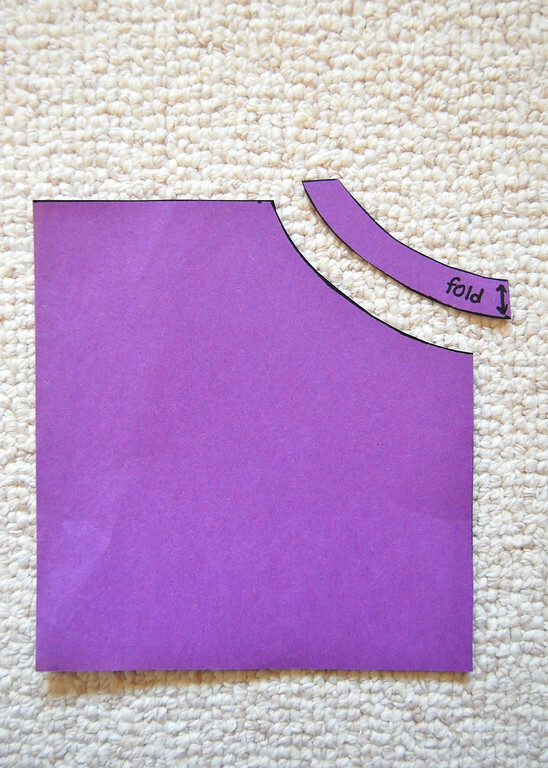 Write "fold" on the bottom end - the one along the side seam (not the yoke). 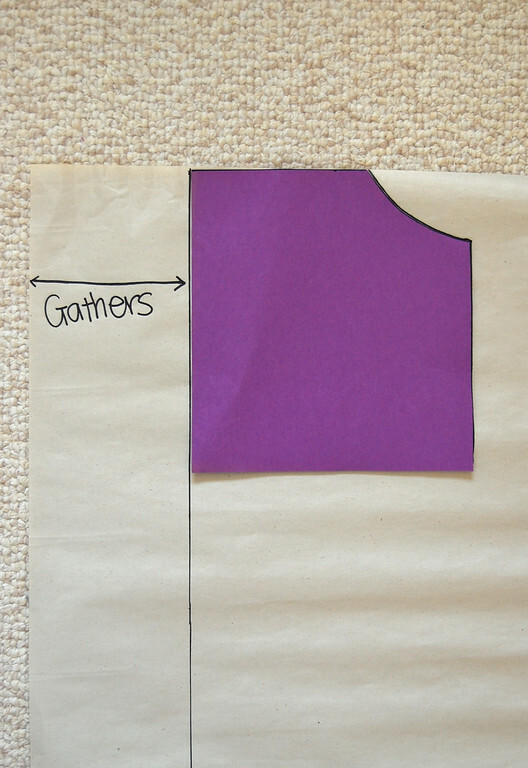 Toss the rest of the purple pattern in the trash. say this... it's a uh... a long skinny rectangle. Go to part II for how to cut and put this jumper together! beautiful! thanks for the great tutorial. Cute jumper!!! Reminds me of the jumpers I used to make for my girls years ago. 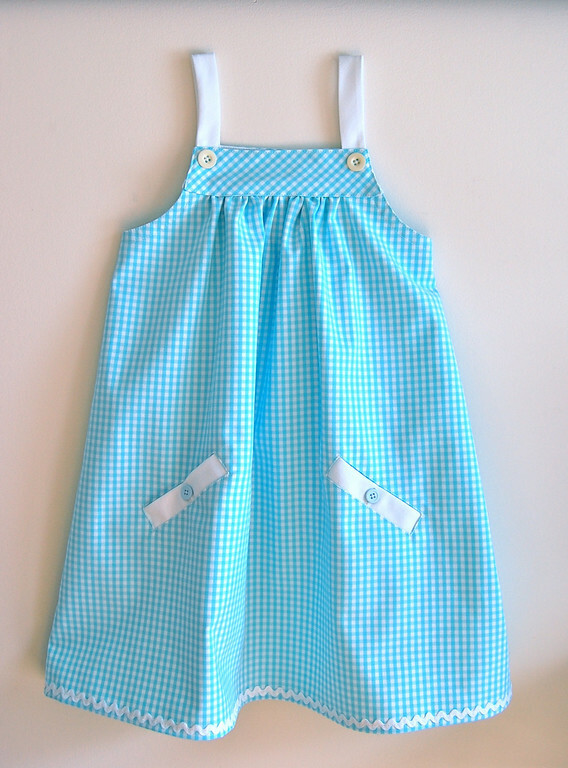 I used to love sewing for my girls when they were young. I also did smocked dresses for them too. I can't wait to be able to sew for my grandchildren when and if I have any down the road. Love & blessings from NC! Thanks for another great tutorial. Just wondering how you would add sleaves to this or the other dress? I nominated you for a Sunshine Award over at my blog! I have followed you for quite awhile but I am in love with all those dresses you have been putting up! Hi Bobbie - thanks for the award! Couldn't link back to your blog, though, to thank you! Thank you, you are very kind to share your talents of teaching, artistry and love in every stitch. So thank you from the bottom of my heart. It's like having a someone hand down a family trade/secret just to you. Hope this makes sense, cause I am so grateful. Thank you so much for this detailed tutorial! It is really amazing! Could you please explain to me something please.... Do we gather also the centre of the back of the dress?? Thank you very much for yr reply. Apparently, the back is the same as the front (it also has gathers) but you can use the same ratio or a smaller ratio if you want fewer gathers and a smoother line along the back.